Have you watched the Disney’s famous movie “Finding Nemo”, in which an orange fish called Nemo gets lost and his dad goes its search? Both of these fishes are the clownfish. 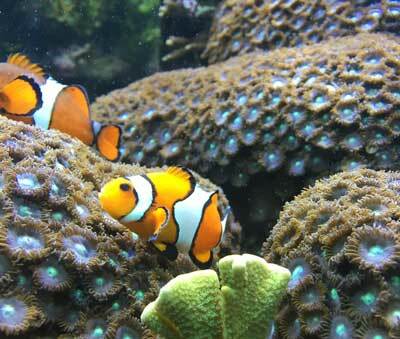 They are orange and yellow in color and are sometimes called anemonefish. There are 28 species of clownfish, each having different colors. They are called anemonefish because they have an amazing relationship with anemones in the sea. Anemones are the predatory sea animals which look like a plant and have a lot of poisonous tentacles. Clownfish are immune to the poison of anemone and live within them to get protection from predators. They, in turn, eat the parasites of anemone and make them clean. Clownfish are small fishes; they grow about 4 inches in length. They have a bright yellow colored body with 3 white stripes and black outlines on the body. However, some species have orange and maroon colored bodies. Clownfish can eat both sea plants and small sea animals (they are omnivorous). They can eat the undigested or residual food from their partner anemone. But, their primary food source is zooplankton. Clownfish prefer to live in warm water. They are found in the Indian Ocean, Pacific Ocean, Great coral reef, and Red sea. They live near the shallow waters of lagoons, and under the shelter of reefs with anemones. Clownfish are not observed in the Atlantic. Clownfish live under the shelter of reefs. These reefs have been destroyed by humans from many years. The destruction of reefs has affected the population and growth of clownfish. 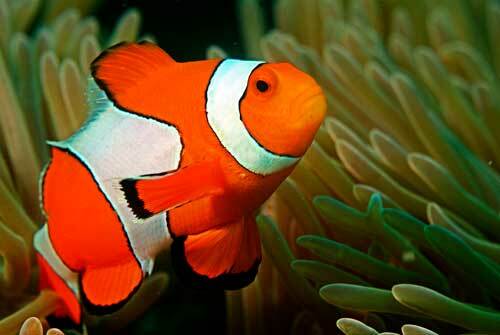 The movie “Finding Nemo” has increased the demand of clownfish to be kept as a pet. Many children have flushed their pet clownfish in the toilets, thinking that they are giving them freedom as they have seen in the Finding Nemo movie. Obviously, these stupid activities are causing the damage to the life of clownfish. Parents should aware their children about the reality of the clownfish. Clownfish sometimes eat the tentacles of its partner anemone. Female clownfish is dominant in the group. When the dominant female dies, a strong male takes its charge and becomes a female. Females clownfish can lay more than 1000 eggs. These eggs are guarded by the males. Abdul Wahab, "Clownfish," in Science4Fun, April 13, 2019, http://science4fun.info/clownfish/.